COOL GADGETS: A weaponized briefcase, complete with poison gas, knife, coins, and more, given to Bond by Q, who makes his first appearance in the series. Actor Desmond Llewelyn would continue in the role until 1999's The World Is Not Enough. THEME SONG: "From Russia with Love," sung by Matt Munro. The song plays without lyrics over the opening credits, and then with lyrics over the end credits. IMDB PLOT SUMMARY: James Bond willingly falls into an assassination ploy involving a naive Russian beauty in order to retrieve a Soviet encryption device that was stolen by SPECTRE. 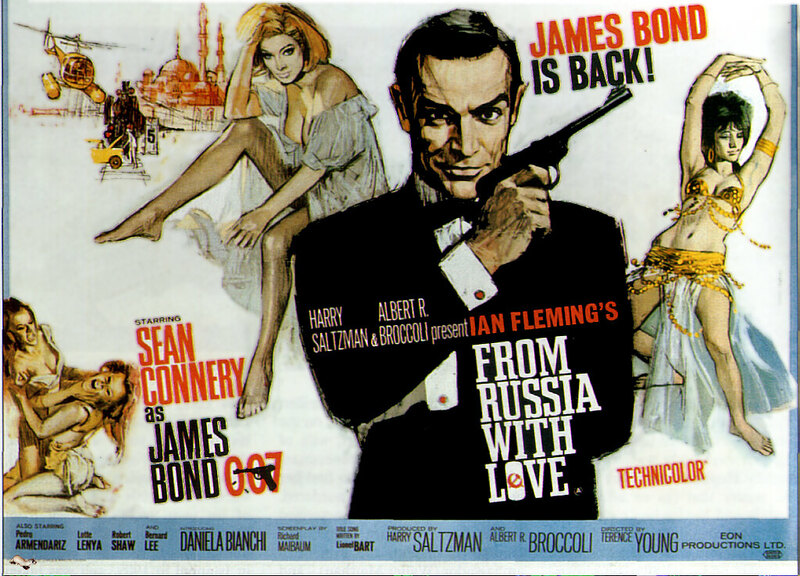 ICONIC MOMENTS: Introduced the first pre-credits action sequence (a fake Bond is hunted and killed by bad guy Red Grant), and the first opening credits set to the film's theme song, both of which would later become series hallmarks. FUN FACTS: Everyone knows the Goldeneye game, but in 2005, Playstation also made a video game out of From Russia with Love. This is the last movie that JFK saw before his assassination. VERDICT: A marked improvement over Dr. No. The character dynamics thrill as much as the action. This is much more sophisticated storytelling, with Bond and Tatiana playing and double-crossing each other amidst constantly shifting allegiances and motivations. While the action sequences in Dr. No are few if any, here, we're treated to one memorable action set-piece after another. There is an awesome, brutal fight between Bond and Red Grant (Robert Shaw from Jaws!) on a moving train that still holds up, even by today's standards. A helicopter chase is unnecessary but exciting, if hugely derivative of North by Northwest. Fans of Austin Powers will see plenty of parodic inspiration in From Russia with Love. The main henchwoman, Rosa Klebb (Lotte Lenya) is a dead ringer for Frau Farbissina, and proves to be a worthy foe for Bond (given that she's a lesbian and therefore impervious to Bond's wily charms). We get our first Blofeld appearance , even if we only ever see his hand stroking that furry white cat. All in all, this is one of the best Bond outings. It's fun, but not as campy as many later Bond films will prove to be.